Macenmist is the property name and also a registered breed prefix. Our first litter of Border Collies was registered in 1995. As time went on we needed to design labels for our wines, so it was decided that the Macenmist Border Collies would individually feature on each variety produced. Macenmist Silken Socks (Scoobie) is the Shiraz; Macenmist Stirling Storm (Pebbles) is the Cabernet Sauvignon and Macenmist Quinntesential (Missy) is the Chardonnay. 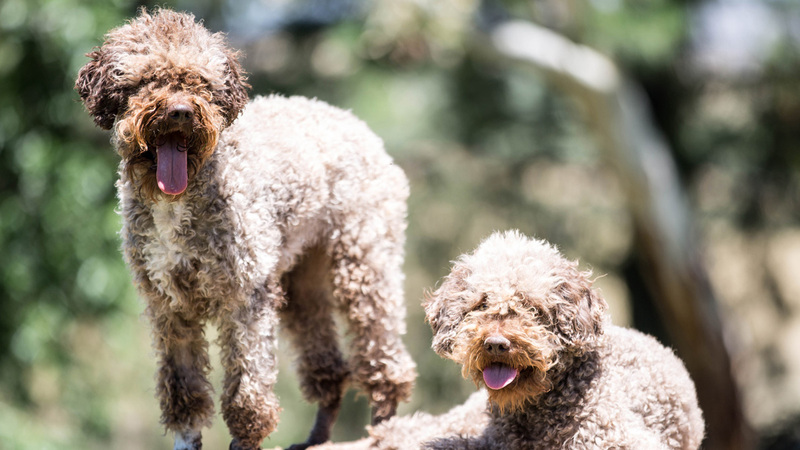 Macenmist’s Truffle dogs are Lagotto Romagnolos, which are the original truffle dogs and famous for their truffle hunting skills. The Lagotto is one of the earliest known pure breeds and is the forebear of a number of today’s dog breeds. Our two Lagottos are Ch Tartufo Adelina (Fahren) and Ch Amicileale Emilia Cesena (Tawdiffu). Fahren was born on 14 March 2011 and in year one of her life she became an Australian Champion and also found her first truffles. Tawdiffu, our second truffle dog born on 13 June in 2015 and arrived at Macenmist just in time to learn how to find truffles alongside her mentor Fahren. Now both our dogs work closely together to find truffles. All our dogs appear regularly on the Macenmist Facebook and Instagram.